A recent report from MIT announces the arrival of a new metaphysical player in the game of business: data capital. This new form of wealth violates not only the tenets of liberal political economy, but also those of traditional ontology. Data are “non-rivalrous,” meaning they can be copied at virtually no marginal cost and used simultaneously by multiple agents without detriment to their enjoyment. When information becomes capital, capitalism hovers in the negative space between Hegel and Marx. The metaphysical subtleties and theological niceties of data capital are hard to miss. 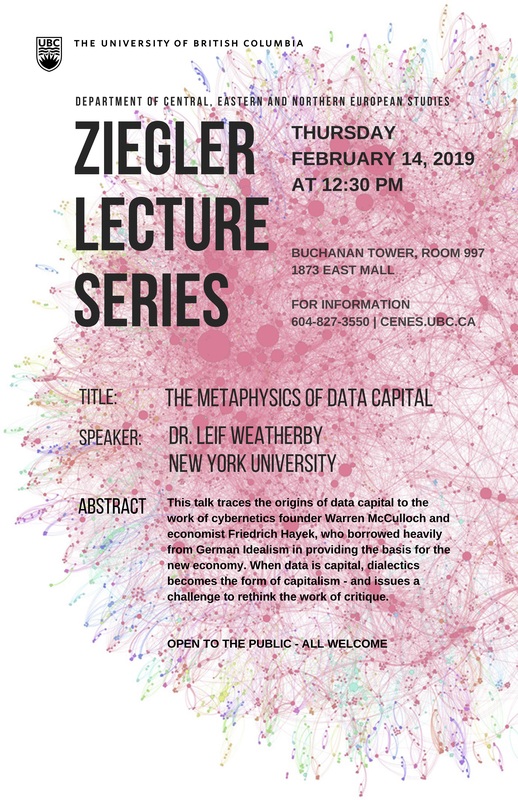 This talk traces the origins of data capital to the work of cybernetics founder Warren McCulloch and economist Friedrich Hayek, who borrowed heavily from German Idealism in providing the basis for the new economy. When data is capital, dialectics becomes the form of capitalism—and issues a challenge to rethink the work of critique. Dr. Leif Weatherby’s research focuses on German Romanticism and Idealism, the philosophy of technology and media, Marxism and neoliberalism and the notion of the digital. He has been awarded grants from the Alexander von Humboldt Foundation, the National Endowment for the Humanities, and the Max Planck Institute for the History of Science. His most recent book, Transplanting the Metaphysical Organ: German Romanticism between Leibniz and Marx (Fordham UP, 2016) engages with the Romantic philosophy of “organology,” a metaphysics meant to theorize, and ultimately alter, the structure of a politically and scientifically destabilized world.